When it comes to welding, installing and sheet metal fabrication Florence, SC, D&L should be your first call. From your CAD files, paper drawings and even hand-sketched ideas, we can establish the best plan for your particular application. Our array of metal produced includes galvanized, black iron, stainless steel, paint grip and copper sheet metal ranging in thickness from 26 gauge to 10 gauge and up to 10 feet in length. 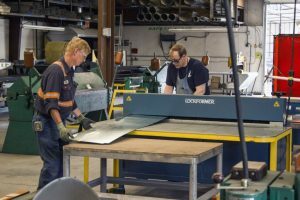 Whatever your manufacturing and installation needs for sheet metal fabrication Florence, SC might be, let the sheet metal fabrication team of D&L bring our 40 years of experience to the table and help you explore every option to complete your project in a timely and cost-effective manner.